Looking for an excellent iOS8 and Swift development course? I can highly recommend a course over at UDEMY. The name of the course is The Complete iOS8 and Swift Course – by Mr. Rob Percival. I’ve gone through 38 lectures so far. This is one of the best online courses I’ve taken, and really feels like I’m in a classroom with an instructor. The course does run $199.00 however UDEMY frequently runs specials on their courses. 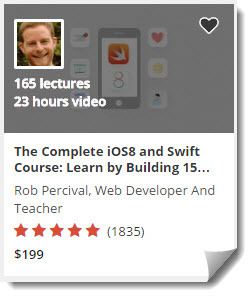 There are several iOS8 courses on UDEMY however this is the only one that has close to 2,000 ratings along with 72,575 students enrolled and a solid 5-star rating. The course link is https://www.udemy.com/complete-ios-developer-course/?dtcode=2UB5wbi2COiV. Course includes 23 hours of video, and 165 lectures along with an active message forum. No MAC? No problem, you’re shown how to install a virtual machine on your PC and run MAC OS X Mavericks V10.9. I did end up buying a Mac Mini as I could not get virtualization working on any of my PCs (all AMD based). I’ll provide updates as I work through the course, however having a background in Software Development has definitely helped me work through the course. Although many of the concepts you do learn do require knowledge of object oriented programming (something that I’ve not done in the past), I’m still able to work through the course.